What a final between two Marks. 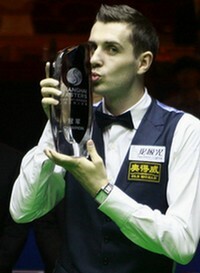 It was Mark Selby won the Shanghai Masters 2011 Title by beating Mark Williams 10-9. The final was a controversial, tense and memorable one. An incident happened that may dramatically turned the result upside down. Please read the whole article and the video for full details. The final is in best of 19, that means the player who first gets 10 frames to take the title. The final started with very dramatic opener. Selby caught the left by Williams to make 74 to lead 74-14. When everyone thought that Selby grabbed the first frame in his bag, Williams received 4 foul points and freeball by a snooker he made. Williams successfully had total clearance to steal the first frame by 75-74. A very scrappy start. Selby took the second and third frame with 46, 113 respectively to lead 2-1 before Williams levelled 4-4 with 72. Selby was once again in front of Williams 3-2 but Williams knocked 132, second century of the match to level again. Selby won the tight seventh frame and eighth one with 95. Selby extended his advantage to two frames difference. In the last frame in the first session, Selby missed a easy black at 45 so Williams cleared to trail 4-5 before second session. Be honest Selby should have gone further in the match. He played attacking snooker in the first session and he was in his top form. Selby should have won the first and last frame in the session to lead 6-3. 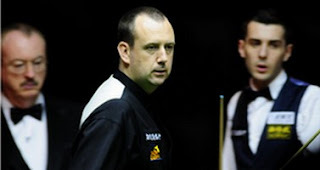 Williams was glad that he was able to stop Selby go further before the second session. Selby did not do well like the first session but still he holds a narrow 7-6 lead during the mid session. Williams was chasing behind Selby during the whole final, and he finally levelled 7-7. Williams only took the lead during the first frame of the final, 1-0. However, Williams took five frames in a row to lead Selby 9-7. It was an extremely important moment to be ahead as Williams only needed one more to win the title. After watching playback for several times, Referee Eirian changed his judgement and called 4 foul points as the red was first touched. Two players reached the decision that Williams would continue to play. Seems that Williams was affected by this incident. Williams immediately missed the red close to the cushion and costed him a frame. Selby pull one back to trail 8-9. The incident did some hurt on Williams. Williams missed the match-winning chance green. Selby cleared up to force a decider 9-9. Williams later showed his bad temper in the decider by playing unreasonable safety shots. It was too late for Williams to turning back - Selby caught his mistakes to win 10-9 by 32 and 25 to guarantee his second ranking title after Welsh Open 2008. It was a dramatic comeback for the Jester - you never know what will happen until the end. Congratulations to Mark Selby who won his second ranking title after three years' waiting. Selby also grabbed the new world number one spot from Williams's hand at the next cut-off point. The victory is one of the most meaningful and remarkable ones in his professional career. "It's a great feeling to be World No 1, all I wanted to do was to get to the top of the sport. But I have to keep up the hard work because others will want to get ahead of me." Williams: “I was robbed. The referee made such an appalling decision. “I was right behind it and 100% it hit the pink first. He said it did then he turned around and said he didn’t see it. “It’s an absolute joke. It cost me the tournament. The balls should have gone back. I don’t mind losing to anyone but the ref has cost me the title, no question. I will say Williams was unlucky to face this situation. I didn't see any reason for him to put the blame on the others, especially the referee. The referees do their job and try to make the best judgement on the balls. Williams should face up to his own mental problems. Yeah this incident did pissed him off and he showed his discontent in the last three frames. He had the chance to end this match but he could not catch them. This is not the first time that Mark Williams lost in the final when he was holding match point. Williams reached four finals in the last twelve months with only winning one - German Masters over Selby. 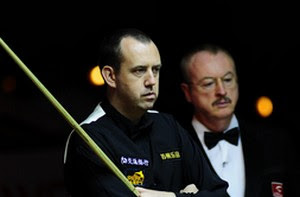 The three loses are all turnovers: UK Championship 2010 lost 9-10 to John Higgins though 9-5 up; Australian Goldfields Open in July defeated by Stuart Bingham 9-8 despite of being 8-5 up and with this one. Williams all had chances to win these three close finals but he could not make them. Mental are important factors in snooker. Williams need to overcome this big problem so as to win more matches even titles. Today after Williams returning to the UK, he wrote on his Chinese Weibo: now reflecting back on it the only person to blame is me, I had plenty of chances and blew it, perhaps just not good enough. Could take a while to get over that defeat? Sure you will do Mr Mark Williams. Come on the Welsh Potting Machine. Time heals all wounds.